The 2016-17 Premier League season lived up to its reputation as one of the most unpredictable in the world as we saw Swansea and Chelsea and Swansea share the spoils at the Liberty Stadium in a roller coaster of a match. The Blues completely dominated proceedings and took the lead through Diego Costa but two mistakes in two minutes from Thibaut Courtois and Gary Cahill saw Swansea turn the game on its head – equalising through a Sigurdsson penalty and a howler from Gary Cahill which Leroy Fer capitalised on. Antonio Conte’s men did equalise as Costa scored a wonderful bicycle kick but Chelsea fall two points behind leaders Manchester City who beat Manchester United 2-1 on Saturday. Let’s take a look and how the players performed. The goalkeeper showed some indecision by not claiming a high ball which led to Diego Costa's opener. 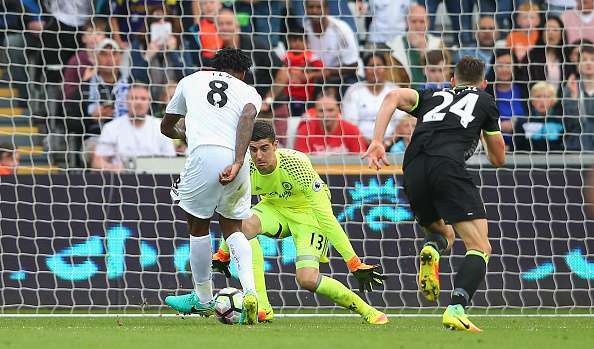 He did make up for it by denying Hazard with a great stop minutes later and a great save on Oscar’s long-range effort in the second half. Saved a flurry of late efforts including a Diego Costa effort to get Swansea over the line and pick up a hard earned point. Provided a decent option going forward and although he found it difficult to deal with Eden Hazard, he did as well as can be expected when faced with the diminutive Belgian. It wasn’t a terrible outing for the Englishman. The Argentine was booked as well for a tackle on Costa. Fernandez found it difficult to handle the Chelsea striker all afternoon and was constantly on the backfoot. Regrouped well along with Amat to guide Swansea to a draw at least. Amat was booked for a late aerial challenge which left Costa on the ground for a few minutes. He kept getting into tussles with Costa and was probably a little lucky to not be sent off. Defended stoutly against late Chelsea pressure despite conceding an equaliser. The young Scot was moved to left-back from centre-back as Swansea switched to a back four late in the first half. He gave a decent account of himself throughout the game and has made a good claim to be the manager’s first choice left-back. After a subdued start to the game, the left wing-back was taken off late in the first half as his manager decided to make a tactical switch. Taylor was clearly unhappy with the decision and let his manager know it. A few decent moments and some tidy passing for the Swansea midfielder. He did well to break for Swansea and relieve the pressure after their two goals. The game completely ran past Jack Cork as he was overrun by the Chelsea midfield and was overshadowed by Fer and Sigurdsson. Fer received the first booking of the game for a late challenge on Diego Costa when the Spaniard looked to set Chelsea off on a counter. He was able to play a great pass to set off Barrow which led to Swansea's penalty and followed it up by harrying Gary Cahill and scoring to send the Liberty Stadium into raptures. Fer looked like a different player after this and was a constant thorn in Chelsea’s side by threatening on the counter attack. Sigurdsson was Swansea’s brightest spark in the first half, driving his team forward whenever possible. He earned and converted a penalty to bring Swansea level around the hour mark and continued to impress. An anonymous performance from Llorente was he was handled with ease by Terry and Cahill. He looks like a shadow of the player he was for Athletic Bilbao. Barrow was brought on just before half time to provide Swansea with greater incision going forward. He was able to do exactly that as he latched onto a long ball and led the counter-attack which got the Swans with a penalty. He was a real live-wire and fully justified his manager’s faith in him. Rangel came on in the final minute for Sigurdsson as Swansea looked to close out a draw and did his job.